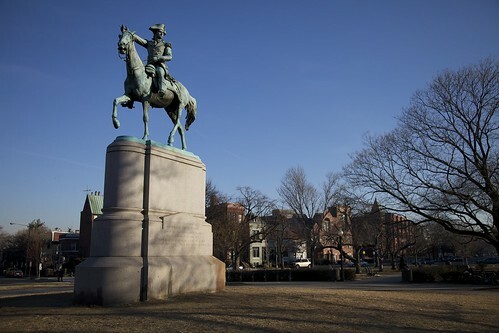 In the center of Stanton Square in Northeast, stands Revolutionary War Hero and native son of Rhode Island Nathanael Greene. His controversial advice (including burning New York City to the ground as part of a retreat in 1776, which, to me, sounds like the wisdom of the sages) won him favor with General Washington, and his management of the supply chain of the Continental Army won him the post of Quartermaster General. Before the end of the War he’d serve as the head of West Point, and then Commander of the Southern Army. Greene would lead the American Retreat across the Dan River, forcing General Cornwallis to make mistakes as he chased the retreating light horse. Greene’s beleaguered force would win the race to the Dan, taking all the boats across the river, leaving none for Cornwallis, and the American forces escaped into Virginia. 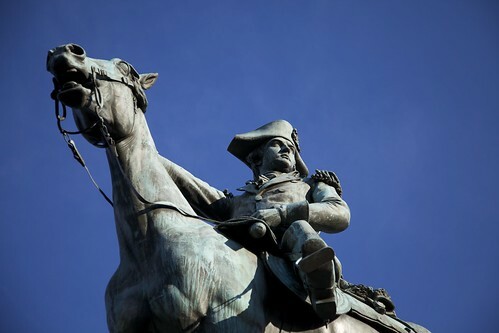 Some say that Greene was second only to Washington himself in military ability and prowess, and did more for the Continental Army than many others who would go on to claim greater fame. After the conclusion of hostilities, Georgia and both Carolinas granted Greene significant estates and money, most of which he used to settle the bills of the Southern Army. He turned down Cabinet appointments from President Washington and would retire to Savannah in 1785. He would die just a year later of sunstroke. Greene is one of the unsung heroes of the Revolutionary War, and his statue in Stanton Square (which is oddly named for the Secretary of War in the Reconstruction Era and not for Greene) is small tribute to the right hand of George Washington. Interesting factoid: Greene’s Southern Campaign is generally considered by military historians to be the finest insurgency campaign in history until Mao’s campaign in China in the early 20th century.